MP PAT 2019: MP PAT will be conducted to offer admission into B.Sc and B.Tech in the field of Agriculture, Forestry, and Horticulture. These courses will be offered by the colleges/institutions situated in MP state. This exam will be managed by the Madhya Pradesh Professional Examination Board or MP Vyapam. It is a state level entrance test. 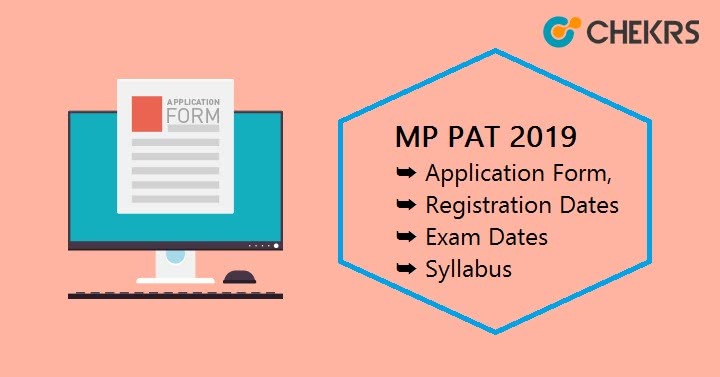 In this article, candidates can get all the details of MP PAT exam including details of MP PAT Application Form, Registration Dates, and Exam Syllabus etc. Managed by: Madhya Pradesh Professional Examination Board, Bhopal or MP Vyapam. Candidates are advised to read the eligibility criteria for this examination before filling the application form. The eligibility criteria details for MP PAT 2019 are mentioned below. B.Sc (Agriculture)/ B.Sc (Horticulture) Passed 10+2 or its equivalent examination with Physics, Chemistry & any one of the Biology, Forestry, Mathematics or Agriculture subjects. B.Sc (Forestry) Passed 10+2 or its equivalent examination with Physics, Chemistry and any one of the Agriculture, Mathematics, Bio-Technology and Forestry subjects. B.Tech (Agriculture Engineering) Passed 10+2 or its equivalent examination with Physics, Chemistry, Mathematics & English subjects. *Candidates who are appearing in above qualifying exams can also apply. The application form will be issued online by the examination board on the website. Eligible candidates can fill the MP PAT Application form from the 3rd week of March 2019 till the 1st week of April 2019. Application correction procedure will be also started along with the MP PAT 2019 Application release. Candidates can perform correction till the 2nd week of April 2019. Candidates are also advised to take a print-out of filled Application form for any further use. Candidates have to pay application fee after filling the MP PAT Registration/application form. The application fee can be submitted through online mode via credit card, debit card, and net banking. Reserved category candidates of MP has to pay Rs. 250/- as an MP PAT Application fee. Eligible and Interested candidates can fill and submit MP PAT 2019 Application Form using following steps. Candidates have to visit the official website’ MP online portal ‘. Login to it, and click on ‘Citizen Service’ and you will be redirected to the application form page. After it, read the instructions and click on ‘continue’ button. Now candidates have to fill the required details like personal details, educational qualification, contact details, etc. Now after it, click on ‘Browse’ button then candidates have to upload their recent scanned color photograph, proof of handwriting and signature. After checking all the filled details, verify the details, and then click on the ‘Submit’ button. After filling the form click on “Proceed to Pay” and make a payment of application fees through the available modes. After making the payment, take the printout of the filled-in application, and receipt for further process. Here, we are providing basic exam pattern of MP PAT 2019. The exam will be conducted in 2 sessions, i.e. morning and evening. The Paper will have 200 questions and the exam will be conducted in Offline mode. Marking Scheme Candidates will be allotted 1 mark for each correct answer. The syllabus will be released online on the official website by the MP Vyapam. The MP PAT 2019 Syllabus will cover all the topics & chapters of class 11th & 12th subjects, i.e. Physics, Chemistry, and Mathematics/Biology & Agriculture. The admit card is expected to be available online in the third week of April 2019.here will be 2 admit cards. Candidates will get the MP PAT Hall Ticket by entering their application number on the official website. Applicants have to download both the parts & bring it on the day of the exam along with a valid photo ID proof. The Result will be probably declared in the 1st week of May 2019. Candidates can view their results online mode on the official website. Answer keys will be also released online on the website. After declaring the MP PAT Result, the Authority/board will prepare and release a separate merit list which will be based on the candidate’s marks in the MP PAT 2019 Examination. After the result declaration, counselling will be started through online mode, probably in the month of June 2019. Candidates have to log in to the official website and then they need to fill the number of choices of colleges & courses as per their preferences. After filling the form, seats will be allotted to the eligible candidates. The seat will be allotted on the basis of the rank, availability of seats, reservation, filled choices, etc. After MP PAT Seat Allotment, candidates have to report to the allotted institute/colleges. Candidates have to bring all the required documents at the time of reporting because their documents will be verified there. After successful verification, all the eligible and qualified candidates will get admission in their preferred courses.